I have been making things of wood and metal for a good long time. I started at age 6 in a woodworking class at the 92nd Street Y and I haven’t stopped since. In the past twenty years or so, as running a business has taken over my life, I have worked less in the shop, but I still get some time in. Perhaps more importantly, I have my years of experience of making things. I think my situation is pretty common with anyone my age. You Tube has many videos entitled “The last _____ (fill in the blank).” The videos typically feature some old guy who is making things exactly the made his grandpappy made them in 1910. And when the guy complains that he doesn’t have any apprentices (and hasn’t since 1967), you immediately think, “Of course! Who would want that job trying to make a living in that old shop?” We all sympathize and tut-tut about the old guy’s challenges, and on one level we think it would be kind of cool being the apprentice, but ultimately most craftspeople I know want to learn about the past in the context of working in the future, not as a museum piece. This doesn't mean many people don't try to master the old ways; many do. It also doesn't mean people don't try to earn a traditional living. But it's really hard to do so. Typically even wonderfully skilled craftspeople have to supplement their income with instruction. Teaching can be great, but many feel sad that the market that will sustain traditional work done traditionally is so small. I might be a fossil, but I am surely not dead. So I’m still learning. I’ve been spending nights and weekends learning CAM using Fusion 360. It’s something I need to know. My experience as an engineer decades ago is making the process go pretty quick, but there’s still a learning curve. A long time ago I taught CAD to draftsmen --- back in the early days, with software that was very primitive in comparison to what’s available nowadays. I realized then that the draftsmen knew how to draft a lot better than I did. All I really needed to do is teach them was which button to push. When I did, a lot of the students thanked me because they had been really intimidated by the software. Many had been scared that they would have to go get a job at smaller companies that still did drafting by pencil. The really cool part was that these draftsmen quickly became the fastest and most productive members of the entire crew of drafting people and ended up with better, more productive jobs. I think we all need to recognize that most craft knowledge isn’t written down. Becoming a master involves practice -- and staying a master involves a balancing act of receptivity to new tools along with a respectful understanding what has come before us. I also think that some of the younger folks should acknowledge that us old folks have the skill - we just need a little new training in which new button to push. While we are on the subject of new tricks, I am in the middle of designing a new kitchen for my home. 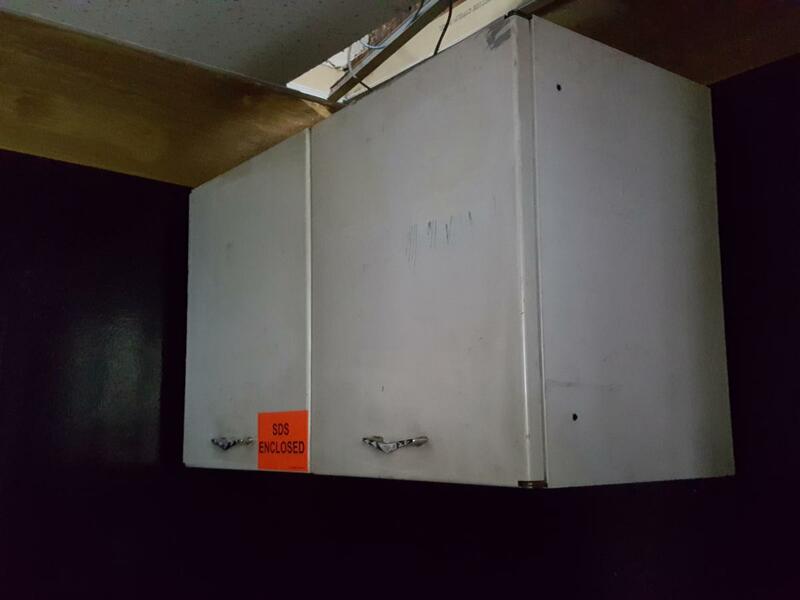 When my parents redid their kitchen in the mid 1960's, they went for "all hygienic" metal cabinets. At the time these cabinets were pretty pricey, so my parents took the cabinets with them when they moved. And the cabinets live on - they made the move to the TFWW shop. They're still doing useful service 50 years later (See picture above). My current kitchen was built (I think) in the 1970's with the cabinet construction built in place, with long rails connecting all the cabinets. The hardware is random, and - except for a drawer slide that I installed about 10 years ago - the drawers all run on wooden frames. Part of the reason I had been shying away from building my own kitchen was the thought of having to mill up all the materials myself. A new kitchen is a big project, and I just could not see myself committing to this project on top of all the other commitments I already have. However, one of the younger members of my staff, a professional woodworker, turned me on to something that I didn't even know until recently was very practical. The plan is to ship the design off to a CNC router guy. For the price of materials and a fixed cost for routing, I will get back a custom kit, just like a pre-fab cabinet, only to my exact design. It amazes me is how much things have changed since I was a kid. Being receptive to new ways of doing things helps me feel much less overwhelmed by the project. I certainly could do it a little less expensively if I cut the panels myself, but not by a lot. So for all of my love for traditional technique and traditional tools, my latest project, one of necessity, will be made with modern materials and modern methods. My experience in woodworking over the years certainly hasn't made me an expert in CNC woodworking. (Far from it.) What this experience does grant, however, is to enable me to build and learn. As modern woodworking techniques take over professional practice, there are fewer and fewer professionals who can do hand work at speed. But the satisfaction hand work gives to people hasn't changed. Fewer and fewer people really want to have Colonial style furniture in their homes, but every day we see how younger woodworkers are learning old techniques to open up what they can design and execute. In my particular case, my kitchen cabinets will be CNC, but the cabinet and drawer pulls I am planning to sculpt by hand out of wood. So my skill will be used, and the final product will be something someone without hand skills won't be able to easily make. One important parameter is: how long can you/your wife live without a real kitchen? Good for you. You get the Kitchen you can create and the knowledge of how to do it all in one package. I am having similar problems with the Makery up at our library. They want me to just tell them what I want to make and they will make it but I want to learn how they are doing it and do it myself. Reminds me of being a little kid and yelling Mom, I want to do it myself. Great article Joel! You probably possess the same talent a lot of us "old dogs" do, the ability to "figure stuff out", which is often another lost skill today. Thanks for reminding us that learning different skills is not just something for older people, it's a necessity for all ages to stay engaged in work,...and in life. In a former corporate exec life I shared the responsibility for regional and nationa training conferences attended by our licensed financial services reps around the country. A somewhat surprising behavior pattern was evident, in that the old dogs who had been successfully practicing their trade for many years were all sitting in the front of the rooms listening and absorbing the information, participating in discussions and QA sessions and then comparing notes during the breaks. In the meantime many of the young bucks were shooting the bull in the hallways basking in their own self-importance while trying to impress the staff members assigned to varios admin duties related to the programs. I was also involved in the decision-making process regarding the percentage of travel expenses we would pay for those attending subsequent conferences. Guess where the complaints came from? I'm mostly watching videos and practicing. I do have younger, smarter, colleagues to ask for help too. have been the most helpful. Since I have a CAD and Software background the learning curve has had issues but mostly it have been learning which button to push. The comments re figuring things out being a lost skill and the old dogs sitting at the front of the room seems to me to be too general and smacks of 'us versus them'. I'm an old dog but I know and have known plenty of young dogs that can figure things out and that sat at the front of the room at training sessions....it's all a matter of perspective.